The Violin Maker’s Plane (A.K.A. the #101) is one of Lie-Nielsen’s newest planes, and the smallest to use a captive nut adjuster, which is such a bonus when dialing up the perfect shaving. This plane is based loosely on Stanley’s #101, but Lie-Nielsen has made a number of improvements to the original design. The body and cap are made from Manganese Bronze, which add some mass to the plane, bringing it in at a hefty 1/2 pound. Another added benefit of Manganese Bronze is it doesn’t rust. This plane is just less than 3 1/2″ long, and has a 7/8″ wide A2 iron that is a full 1/8″ thick, and really holds an edge a long time. The iron is bedded at 20 degrees and operates in the bevel up configuration, and as usual, the iron comes honed to 600-grit on both the bevel and the back. I recommend honing both sides up through 8000 grit, as this provides a razor-like sharpness that is ready to take on any wood you decide to try. Take a look at this sharpening video for more details on the process. The size of the Violin Maker’s plane is small enough that you can work in very tight areas, and with such a short length, it can easily handle sections that aren’t totally flat, as long as the “waves” aren’t too close together. That being said, I want to make sure you all know this plane isn’t only for violinmakers. While the somewhat diminutive size does make it handy for instrument makers, it can be used across the board (pun intended). The depth of cut for many planes of this stature is adjusted by reducing pressure on the iron, and then tapping lightly on the back of the iron. When using this style of adjustment, you’re basically just trying your best not to end up shooting past the intended depth. While there are a large number of planes that operate on the “Tap” principle, the fine movements of a captive nut adjuster makes it so much easier for all skill levels to obtain repeatable results. An aspect of this plane that should be emphasized is the thickness of the iron. An 1/8″ thick iron may seem like a fairly thick iron for this small of a plane, but it radically reduces the chance of any blade flexing or chatter during a cut. Definitely a great reason to go thick. The iron comes from the factory with a 25-degree bevel, but as always, a honing to a minimum of a 30-degree micro-bevel speeds honing and strengthens the iron. 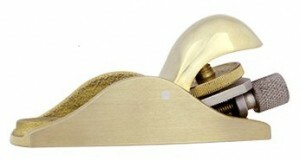 Since this plane’s iron is used bevel up, honing angles above 30 degrees are usable and up to the end user’s discretion. For example, if I were using this plane on some of the extreme curly maple on one of my guitar tops, I’d consider raising the honing angle to 45 degrees or possibly even slightly higher to reduce tear-out. With the 7/8″ iron width, this plane is extremely useful at very focused operations, reducing the chances of accidental contact with unintended areas of a work piece. This super-small plane can easily fit into the pocket of your apron, or even in a pants pocket. You would almost forget it was there, if it wasn’t so functional. Just remember to take it out of your pocket at home before flying, so you don’t have to leave it with the nice TSA agents. Click to take a closer look at the Lie-Nielsen #101 Bronze Violin Maker’s Plane.